Whether you are just starting an exercise routine or you are an avid exerciser looking for a challenge, the Herbert Wellness Center offers a wide variety of group exercise classes to keep you engaged and help you meet your wellness needs. Visit our schedules page for the current group exercise class schedule. Take the "work" out of workout, by mixing low-intensity and high-intensity moves for an interval-style, calorie-burning dance fitness party. Once the Latin and World rhythms take over, you'll see why Zumba® Fitness classes are often called exercise in disguise. Super effective? Check. Super fun? Check and check. 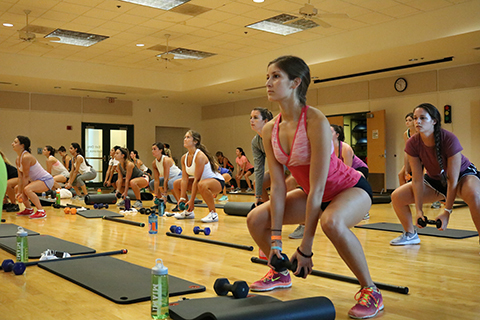 Only current, fees-paid University of Miami students or Herbert Wellness Center members and/or their official guests are eligible to participate in free group exercise classes. Patrons must be at least 13 years of age to participate in any classes offered at the Center. Participants should line up outside the designated entry door. Under no circumstances should members enter the aerobics room until instructed by the door monitor or instructor. Class sessions are limited to a maximum of 55 participants for land classes and 20 participants for water classes. Entry is on a first come, first served basis. After 55 participants have entered, the class will be closed. For safety reasons, participants may only enter an open class until 10 minutes after class start time. After 10 minutes the class is closed.